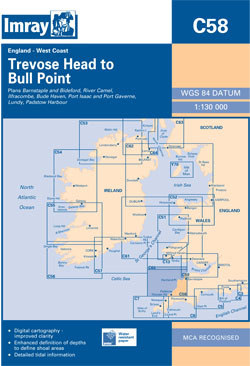 The north coasts of Cornwall and Devon from Padstow to Ilfracombe. Scale: 1 : 130.000. One-minute gridlines. Larger scale plans of Barnstaple and Bideford, River camel, Ilfracombe, Bude Haven, Port Isaac and Portgavern. Tidal stream diagrams.